October was an exciting month for Benjamin Franklin, and for me as I brought him alive to an usually diverse number of venues, and to an equally diverse group of people. Dr. Franklin greeted the Young Professionals Association, Mid-Atlantic chapter, at Jose Garces’ lovely Spanish tapas restaurant, Amada, on a fine autumn evening. They were a lively, intelligent gathering from as far away as Bermuda and Miami. Especially close to Ben Franklin’s heart was the gathering of electrical engineers at the Marriott Hotel in Center City Philadelphia. We had many great conversations, and I think they were electrified by our presence, if I do say so. I spent an afternoon with the elegant Carol Spacht as Betsy Ross and the engaging Bob Branch as Bishop Richard Allen as we entertained the employees of the Philadelphia Electric Company (PECO) as they launched their annual giving campaign. On a glorious rainy day at Stenton, the eighteenth-century former home of James Logan, I presided over the wedding of Anna Marley and Tim McLain. 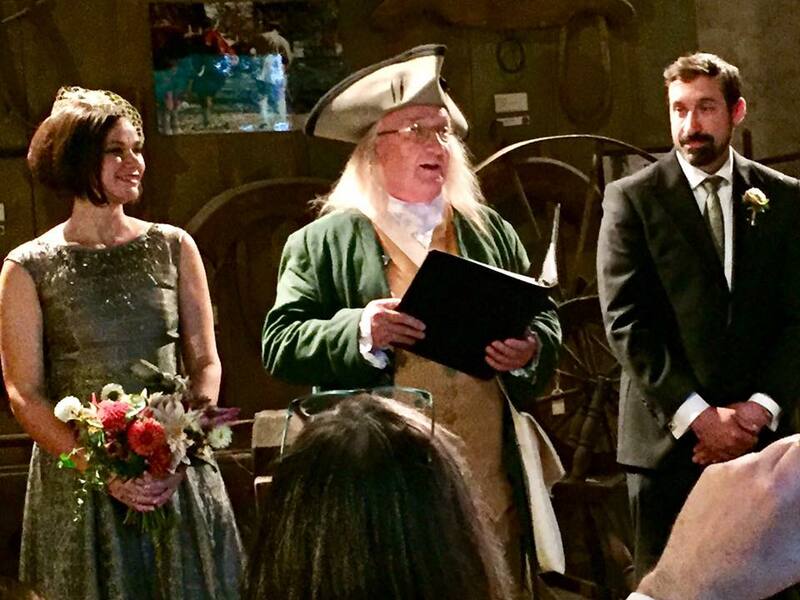 This was Dr. Franklin’s seventh wedding ceremony, all of them made possible by the Pennsylvania Self-Uniting marriage license, which allows a simple printer like Ben Franklin to stand before these folks as they marry one another. It was a beautiful afternoon, as we dined on a pig roast following the ceremony. Last week Dr. Franklin greeted two hundred ESL teachers from around the country, and even joined in the dancing. Franklin and I love teachers. The most unusual of my activities this month transpired thusly: I sat at home on a Friday evening, in post-dinner conversation with Deborah, and around eight o’clock the phone rang. At the other end was Clayton Barmore, manager of the rapper JayIDK, with whom I had spent time on three previous occasions. Franklin had been photographed with the artist for his album cover, and had accompanied him to radio station interviews in New York and to a hip-hop festival in Virginia. When Clay called this time, he asked if I could be in Miami the next morning. Once I cleared my schedule for Saturday, I said of course I could. (This seems to be life with Franklin these days.) I spent Saturday at the Revolt Music Conference in Miami Beach, stayed overnight, and flew home Sunday morning. Live in the fast-lane for BF. Who knows what will happen in November, but whatever it is, I will tell you next month. Until then, be well, and book me.